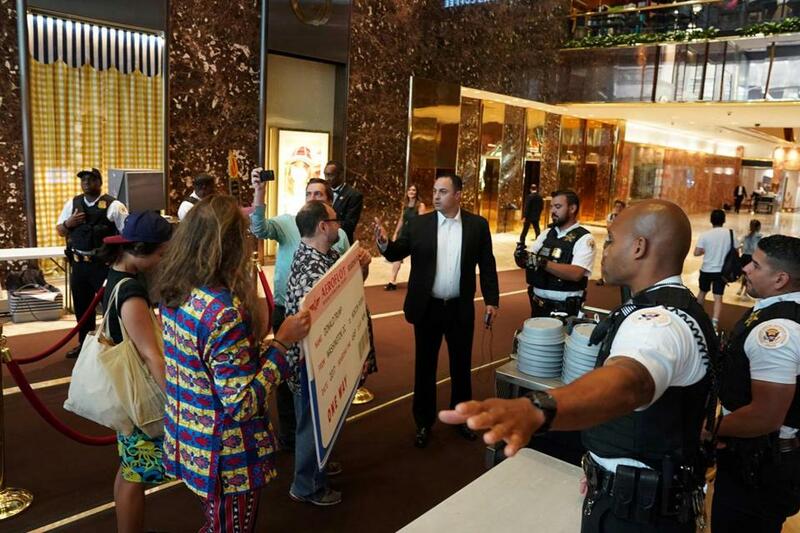 A group of protesters were stopped by Secret Service officers at Trump Tower in Manhattan in June. ‘‘After much consideration, it was mutually determined that it would be more cost effective and logistically practical for the Secret Service to lease space elsewhere,’’ spokeswoman Amanda Miller wrote in an email to The Washington Post. The agency is working ‘‘to obtain permanent work space in an appropriate location,’’ said Catherine Milhoan, a Secret Service spokeswoman. ‘‘The space is still in the process of being obtained and a final decision has not been made,’’ spokeswoman Pamela Dixon wrote in an email. The U.S. military has separately agreed to lease space in Trump Tower for $130,000 a month, according to a lease first reported last month by The Wall Street Journal. That space will be for the White House Military Office, which provides services including communications and the handling of the ‘‘football’’ that the president would use to launch a nuclear attack, the Journal reported. In that case, however, the unit was not leased directly from Trump - but rather from Joel Anderson, a businessman who owns the space. In an interview Thursday, Anderson said that the government didn’t really try to negotiate a lower price. The lease agreement in that case - which runs to 149 pages - illustrates the extra conditions that may come from leasing space to the government. Its provisions ask that the owner of the space follow energy-efficiency guidelines, submit reports on its compliance with fair-hiring practices and post signs with a hotline for reporting contract fraud.